Found this nice '78 and now the resurrection begins... - NGWClub®, Inc. If the odometer is reading correctly, then this is indeed a low mileage bike. 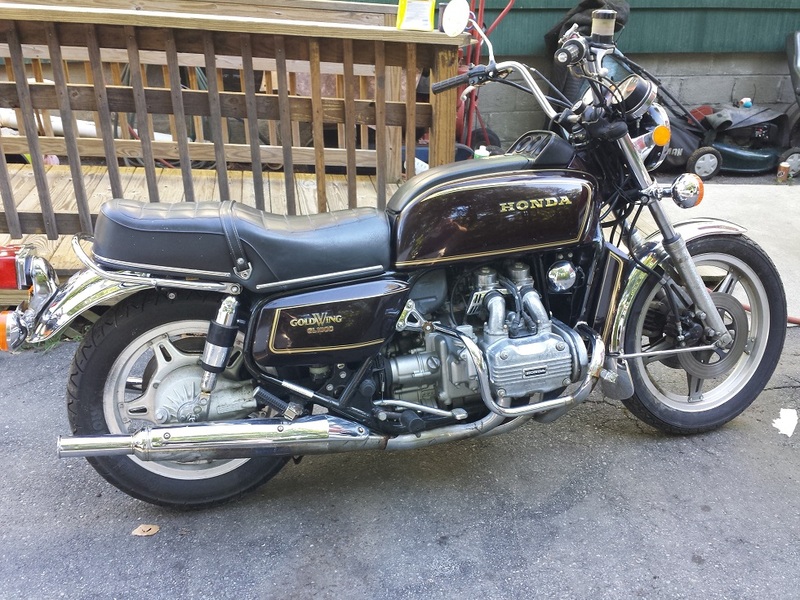 While the seller's description wasn't quite accurate, the bike is in nice shape. Bodywork, although not perfect, is very nice for the age. A good cleaning and waxing will make it look pretty nice for an original paint job. 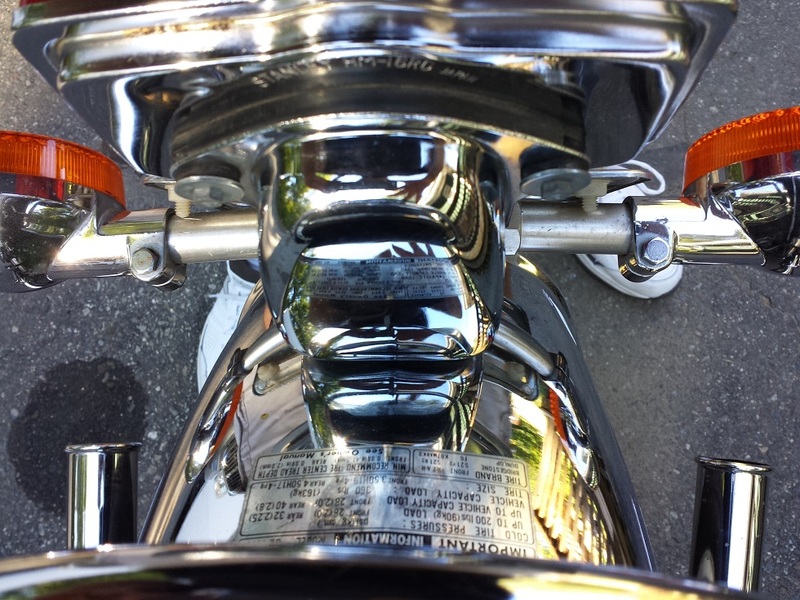 Pros - Low mileage, nice paint, good seat, nice rear fender, clean frame, monroe air shocks, (is this a pro?) nice seat, owner's manual, nearly complete tool kit in cloth pouch. Cons - Right exhaust is rotted at the muffler joint, left chrome ffler tip is bent to the left, chrome muffler guards are damaged, broken clutch cable, carbs need cleaning, fuel tank condition unknown, rear brakes drag, belts will need to be replaced, fork seals leaking, missing tool tray, needs battery, tires cracked form early dry rot, small dent in front fender. Finally, not sure if the engine turns over since the battery was dead and the clutch cable was busted. (unable to turn over by hand) I assume that it's probably ok and would confirm before making an offer. I have virtually everything that this bike needs and in many cases, I've already powder coated many of the parts such as the swingarm, calipers, battery box, etc. Asking price is $1700 firm which I think is too much for a non-running bike that needs work to be back on the road. I'm thinking that for $1000-$1200 it would be a good buy. Considering what it will cost to have my present bodywork professionally repainted with the correct decals, this bike would defray much of that cost. I could get it in good running shape and then put the other one back together and sell it as a running, restorable bike. I need another bike like I need a hole in the head, but this one is at a great starting point. Thoughts and opinions? Last edited by tomk1960 on Sun Mar 11, 2018 8:03 pm, edited 4 times in total. I spoke with the seller tonight and went down the list of repairs that the bike will need. He still thinks it will run after sitting for 10 years, so no sense in arguing. I offered him $1100 and he didn't react badly. Said he'd think about it but he would really like a little more. I don't think too many people are knocking his door down wanting it, so maybe I'll hear back from him in a few days. Last edited by tomk1960 on Sun Mar 11, 2018 8:04 pm, edited 1 time in total. Rear brake rotor looks pretty worn. Put it on the side stand and drop it in to gear. Then turn the engine over with the rear wheel. Take the plugs out and that will be easier. sad that people let things sit... easily it needs, carbs, brakes tires etc. rcmatt007 wrote: sad that people let things sit... easily it needs, carbs, brakes tires etc. Yes. He bought it 10 years ago in running condition and put it in to storage. Fortunately, it was dry storage and that kept things from rusting. I offered him $1100 last night and he called today with a counter offer of $1200. I'm inclined to stick with my offer and not go up any more. It's a nice base to start with, but all of the work needed to get it back on the road will add up quickly, such as tires, brake kits and pads, clutch cable, fork seals, carb cleaning. Gord said to go for it. I might. Plus, as time goes on, it's getting harder and harder to find them in that kind of condition. Sounds like you've made a fair offer. It's hard to let one like this go because you don't want it to end up in the bone yard. You're gonna spend that 100 bucks on something like coffee and cokes anyway. Lay off for a couple months and go get the bike. duke182 wrote: You're gonna spend that 100 bucks on something like coffee and cokes anyway. You make a good point. There's plenty of coke in the shop fridge and coffee here at work is free. I just need to stay out of Dunkin Donuts on weekends and drink the girlfriend's coffee instead. Yes, I want it. Low mileage engine, nice bodywork, good chrome, and plenty of spare parts in my stash to make it even nicer. It could be on the road by next spring. That's the way to talk yourself into it.... I mean; That's the spirit!!! Go for it! Plus, think of all the money you will save by staying home and working on the bike instead of taking your girlfriend out. That could add up to thousands and thousands of $$$$ saved. Dang, you guys are making ME want the bike, fer cryin' out loud. And I'm a continent away!